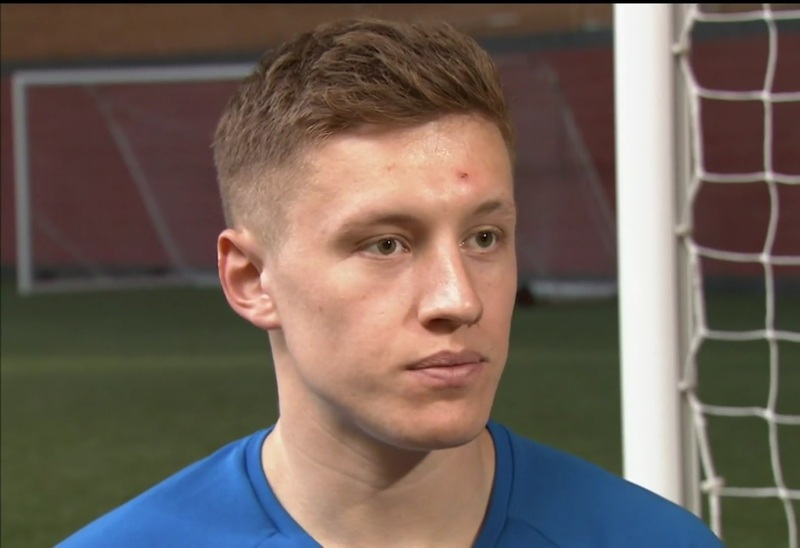 Ibrox Noise: What on earth has happened with Greg Docherty? What on earth has happened with Greg Docherty? Ever since the Hampden debacle, one of Rangers’ most outstanding players of 2018 has inexplicably been consigned to the scrapheap, with just 19 minutes of football since he and team mate Alfredo Morelos had an altercation at the half way line. Greg Docherty, for reasons unknown, has been simply banished from first team affairs. Sure, he makes the bench, but for Jason Holt then Lee Hodson to both be ahead of the ex-Hamilton man today is a sure-fire sign that behind the scenes, something isn’t right. There are some who think he has been a terrible signing, but they are sponsored by the same company who are emblazoned on our refs. The majority have been impressed by his power, combustibility, pace, technical ability, passing and fight for the shirt. It is true his Old Firm at Ibrox wasn’t sparkling, but whose was? After his partnership with Graham Dorrans failed (well, what else when you play someone out of position), it was Docherty who was axed – especially after that Hampden incident. His ex-manager claimed nothing had happened – this was officially and formally announced as the case. And yet Docherty had to look on, as Rangers’ most expensive Scottish signing for a long, long time, from the bench as Lee Hodson replaced the injured Jordan Rossiter this afternoon at Easter Road. This isn’t right. This cannot be right. For his part Docherty has covered himself in dignity. No complaints, and lots of excellent media work – he has not moaned about his loss of status. But this kid is the type of player we need to build our team around – many fans are asking for a Docherty, Rossiter and McCrorie midfield. It lacks creativity but my goodness it’s strong, mobile and will fight for every ball. But for some reason, Jimmy Nicholl didn’t want anything to do with Docherty – and that definitely isn’t using your squad to its best potential. If Docherty has done something wrong, why has the club not dealt with him as they have with Miller and Wallace? If he hasn’t, why has he been scrapped like this? Will time tell? Probably not. Don't know how much weight it holds but it's been said there's a bit of beef between him and Nicholl. There was meant to have been a bit of a do in the tunnel after that game and Nicholl was there. Won't matter slate wiped clean now, he was celebrating like he scored himself today again. I find the situation absolutely baffling......Dorrans is stealing a wage...wheras young Greg would fight tooth and nail for this club.....something not right somewhere? ?.....hopefully Stevie G sees his passion and potential!! Key words - passion and potential. No qualms at all with the lads attitude and commitment, but his distribution is bloody awful. That's probably why he cost £600k and McGinn will probably fetch three times that. In all walks of life personalities clash. And boss always has last say. But boss must have perspective and put matters behind himself. Maybe Muty and Nichol don’t have that ability. Hope Doche Doesnt leave/Get Pushed out! Doche, McCrorie & JR - #BEAST! Yes, totally agree about the Docherty situation. I love the boy, he'll be there for the long haul. 're yesterday, and a much more enlightening fact I have never seen John McGinn, who I rate highly, so outplayed in midfield! The reaon? Clear for everyone - Jordan Rossiter. It was the hardest working, tigerish performance I have seen from a Rangers midfield player since the days of Steve Davis. He was sensational. And as for his positional sense and coolness in notching his goal Wow!!! Yeah love Doche as well! What happened to him is he had 2 or 3 games in a row where he couldn't handle it and the occasion was too big for him and he struggled to hit a 3 yard pass!, so he's been left out..as he should be! Has potential, hasn't shown it enough. Goss is dreadful too in the opposite way. Can't tackle for toffee and has the heart of a mouse. Be glad to see the back of him! Probably picked over Docherty because he moves the ball a bit quicker and is technically better..Neither are good enough at the moment to be in a team that could win the league and we need better! Docherty is a young player with potential - nothing more. He needs to learn from Gerrard and work on his game. Sure he has heart and passion but needs to work on his distribution and positioning. Let’s not invent conspiracy theories where none exist. In three games you could see that Nicholl had the experience that Murty lacked and was able to change things on the park. You could also sense his frustration with a group of players who continued to let themselves and the club and the fans down with their inconsistent attitude. It always strikes me when young players come to Rangers that they are expected to instantly be heroes. These kids both Goss and Docherty joined a shite Rangers team low on confidence with obvious backroom issues. Murty for all his good effort was never a manager. No presence, too nice. These guys needed a Walter an Advocaat and presence to instil belief and discipline. Gerrard has that presence thankfully. It was a big ask of both players to come in and do much better.I like Docherty and once his passing and position is sorted he will settle. Nicol saw them in training and picked the best he could from what dross he had. The seasons over. Goss has marvellous passing ability and anyone who questions his passion needs to remember that tackle against Aberdeen that saw him booked. Crunching (albeit ill advised). Let's let the new manager to his thing and see who we have over the coming weeks. Goss most likely will return to QPR. For me Wallace should be forgiven, the man gave his prime year to the club and has always been a dependable option. Anyone else see Goss acting like a primadonna, punching the dug-out plexi-glass side. Pathetic. He should have done his talking on the park, but Goss was guff. Docherty should have played. Also bears, anyone else think the boy Barjonas hasn't had a fair go, either?